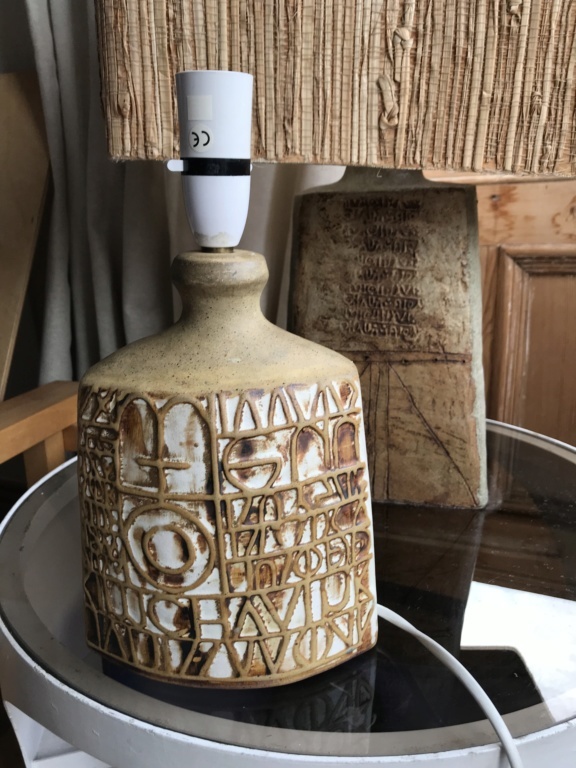 Hi - Can anyone confirm if this is a Bernard Rooke lampbase? Unfortnately not stamped but neither is the one at the back which Bernard himself helped ID? Any help or pointers gratefully received! Other options are Tremean or Wallwork I suppose. Helps to have a base photo even if there’s no mark. Louis Hudson is also a possibility. Yes, Louis Hudson would fit looking at the decoration although the glaze is slightly different and the clay is slightly grittier? I'll do a little more digging, even if I could find another item with the same symbols on it would give me a clue. Tremaen did lamps like this.